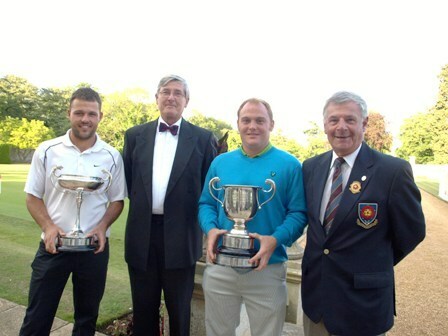 Jon Handyside, Parsons Cup winner (handicap winner), Bill Morgan, Wellingborough Club Captain, Mark Davis, County Champion and Gordon Rising, NGU President. Mark Davis of host club Wellingborough played two very steady rounds of 72 and 73 in difficult dry and windy conditions to secure a 1 stroke victory from Fraser Carnihan of Cold Ashby. Fraser was 4 under for the first 17 holes but ran up a 9 at the tricky 18th hole and then could only manage 73 in the afternoon. In third place was Jon Handyside of Kettering Golf Club with 76 and 71, 147 and fourth was Adam Myers of Northants County with 74 and 73, 147. The Parsons Cup for the best nett score was won by Jon Handyside with 74 and 69, 143 from Mark Davis also on 143 but with 71 and 72. The Braids Driver for the best under 22 years of age player was Adam Myers. Our thanks to Wellingborough Golf Club for the use of their course and their help during the competition.